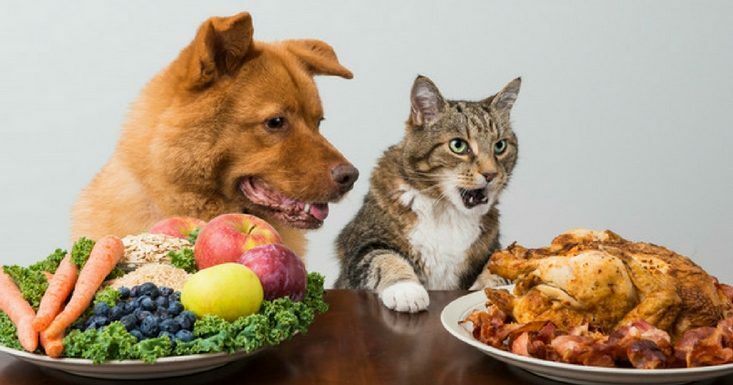 A table full of food and a house full of people to pet them — Thanksgiving seems like every pets dream! Before letting your dog or cat join in on the fun, it’s important to know which Thanksgiving favorites can be dangerous. To make sure your furry friends have a safe holiday, check out this guide to what holiday treats you should and shouldn’t feed your pet. Fatty or rich foods, like beef fat, poultry skin and gravy can cause severe gastrointestinal issues for animals. These include vomiting, diarrhea and excessive gas, but can also lead to more serious conditions like pancreatitis, which can be fatal. Most desserts will be harmful to your dog’s digestive system. Chocolate is highly dangerous for dogs and can be fatal if too much is consumed. Xylitol is an artificial sweetener used in many candies, low-sugar desserts and sometimes even peanut butter. Just a small amount of it can cause a drastic drop in blood pressure for dogs and lead to liver damage. While many vets recommend feeding plain pumpkin to help dogs with bowel and stomach issues, pumpkin pie is not okay for dogs to consume. Not only does it have a variety of spices that can be problematic for canines, too much pumpkin for dogs will only lead to a mess you don’t want. While we often associate dogs with chewing on a nice bone, tossing them the leftovers from your Thanksgiving meal will almost certainly do more harm than good. At the very least, swallowing the bones can cause an upset stomach, but frequently the bones splinter and cause serious damage to the intestines that can quickly become fatal. Pick up a dog-friendly bone from the pet store if you want your pup to have something safe to chew on. The trash is tempting enough to most dogs on a normal day, but with the remains of a Thanksgiving feast in there, it becomes just about irresistible. Make sure the trash can is in a place the dog doesn’t have access to and be sure any visitors in the house know to keep the dog out. Don’t leave leftovers on the table or counter where a daring dog might attempt to reach them and don’t forget to put leftovers in the fridge quickly. Packaging around the turkey such as string, plastic holders and bags may smell like meat and convince some dogs to chew on them. These foreign objects can cause dangerous blockage in your dog’s digestive system if swallowed. If you choose to brine your turkey, make sure your dog doesn’t drink the brine afterwards, as the excessive salt can lead to salt toxicosis. The danger for pets isn’t just found on the table — many popular seasonal plants can pose a problem too. Amaryllis, Baby’s Breath, Sweet William, hydrangeas, Poinsettias and more can be toxic to dogs and cats when chewed or eaten. It’s best to keep any plants out of reach to make sure your pet doesn’t get into something they shouldn’t. There are some Thanksgiving favorites that are okay to give your pooch. Turkey is fine as long as it doesn’t have any bones or skin. Plain, undressed mashed potatoes are okay to share, but once you add butter or other toppings, it’s best to keep them to yourself. Plain green beans and carrots are a great snack to share with dogs even when it’s not the holidays. Of course, to be on the safe side, it’s usually best to pick up some doggie treats from the store before the holiday to make sure your pup can have fun and be safe. If you believe your pet has eaten something they shouldn’t, acting quickly is key. Call your veterinarian or local animal emergency hospital. You can also call the ASPCA Poison Control Hotline at 888-426-4435. Sometimes it’s best for you, your guests and your pet if your furry friend has a safe place to play and enjoy the holiday away from home. Whether you’re traveling or just want peace of mind for Thanksgiving, boarding or daycare are great, safe options for your pup.